If you’re looking for how to make homemade cranberry sauce to accompany your turkey centrepiece, try this easy recipe. It only needs four simple ingredients and a pan of cold water. 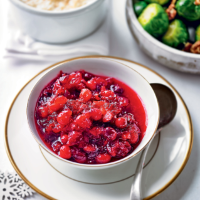 There you have it, the best cranberry sauce recipe you'll ever need. Place the cranberries and the juice and zest of the orange into a small pan with 150ml cold water to cover. Bring to the boil, then simmer gently for 10 minutes until the cranberries have softened and started to burst. Get ahead: make the sauce up to a week in advance, cool and keep it in the fridge, or store in the freezer for up to 3 months. Defrost thoroughly before use.